mod by any means so I'll try and break it down via the good (fuel range), the bad (mounting method), the ugly (petcock assembly). This a copy/paste so I apologize for the formatting. 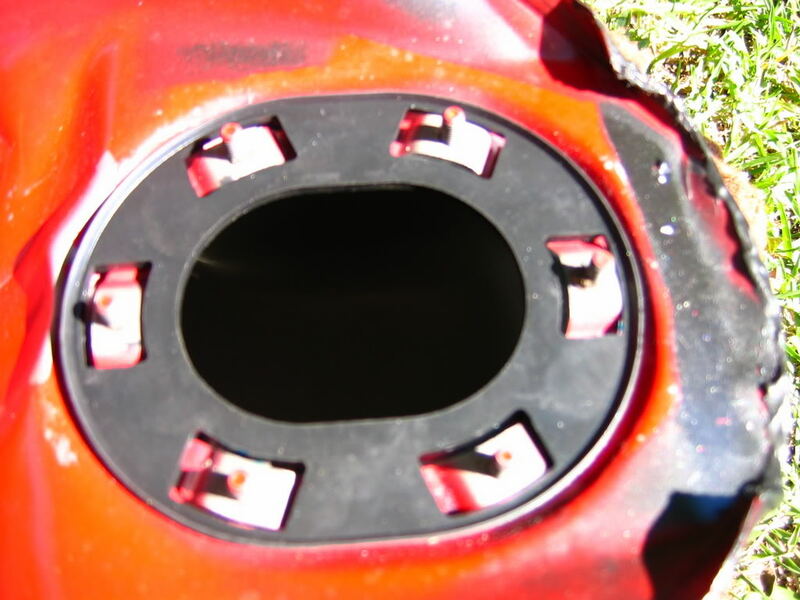 Let's start with the ugly: the tank is for a fuel injected bike and is thus made to contain the fuel pump. two plates that will both seal the large pump opening and be the basis for mounting the VTR's petcock. outer unit bolts to the tank pushing the inner plate tight against the oval seal/gasket. Make sense? seal but worried that it wouldn't resist gas over the long run plus it cuts very easily on edges. wondering why it's situated that particular way). I used locktite on the petcock nut/bolts since the nuts are on the inside of the tank after final assembly. Last edited by superbling; 10-29-2007 at 08:34 PM. Nice write-up!! How did the tests go with the range of the bike? Here's a pic of the assembly mounted. I had to make a bracket to connect the stock frame mount to one of the mounting plate nuts. the rear in position and counters the pull from the front mount when you tightened that one down. Last edited by superbling; 10-29-2007 at 08:35 PM. you my friend are [email protected]%#^* brilliant!!!!! quickly patent your idea before someone steals it, takes it to india, mass rpoduces it and makes a bloody fortune! from the inside. I think one could just hammer the rear tab down to follow the vertical contour of the tank. Another possibility is to cut it down and then have it sealed with a weld. I might do this down the road for more peace of mind. My corbin seat covers this mismatched joint fine but it causes the seat to sit farther back. I was able to compensate somewhat for this with the corbin's adjustable latch. I still need to get this right but it's workable now. in the position I have it now (see pic) and with a tank bra looks OK.
then place it back on the bike and look for obstructions. The more you do this, the lower the tank will eventually sit. You "might" could use it without doing this but it would look really stupid and the rear would be so high that you'd probably lose a gallon or more of capacity since the petcock would be higher than much of the tank! run the risk of dents doing this. Be careful. YMMV. way through the airbox so I got some cap nuts, like the ones used on the mirror mounts, to cover the threads. The front mount doesn't sit flush at the steering neck like the stock unit. I have mine at a level where maybe only a 1/10th of a gallon or so is "wasted" when the tank runs dry. Just a guestimation there. re-route those (no big deal). Unfortunately, I don't have one pic of the underside of the tank. I SWEAR I took one but damn if I can find it now. Next time I remove the tank, I'll make sure to get one and point out the areas I concentrated on. trip, I frequently filled up with 160-170 miles on the odometer and never put in more than 4.8 gallons! because of the distances between fuel stations in the remote region. considering that route. The biggest cost is time since it's all experimental. Last edited by superbling; 06-02-2008 at 02:08 PM. Bling, do you think this would work using the stock VFR fuel pump, going to a pressure regulator? I don't know how much the pump outlet protrudes from the bottom, I'd just like to know if it would create clearance issues. I believe using a pump and a regulator would resolve some of the issues with stalling under heavy braking and idling. Supplying consistent pressure to the carbs would keep them well fed, even when the manifold vacuum drops low enough they would fail to siphon from the petcock. It would also help with complete drainage to use the full capacity of the tank. 1) What pressure would you run? 2) The price. I never see the FI pumps come up used for some reason; very rare and high dollar when the do. The pump is fully enclosed with only the in/out line hookups on the exterior so there's even more clearance than with a petcock, so no probs on that front. Check the threads, we had a fellow from down under who's fitted a pump to a standard tank and reports better drainage. Yes sir, that post is sorta where I got the idea, along with previous experience with drag bikes. 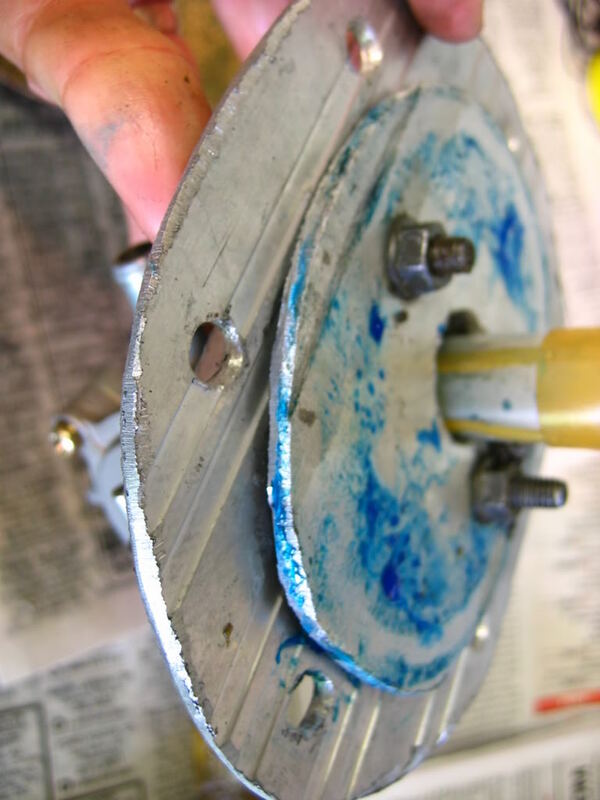 Many drag race teams have found that gravity-feed systems, regardless of the flow capacity, usually end up starving the motor for fuel at some point. This shows up as a power hole and a heat spike on their telemetry. By installing a dedicated fuel pump with a regulator they improve consistency, reliability of the motor, and drop their ETs. Since quite a few drag bikes would have an onboard fuel pump for the Nitrous Oxide system anyway, it's not really adding anything unnecessary. 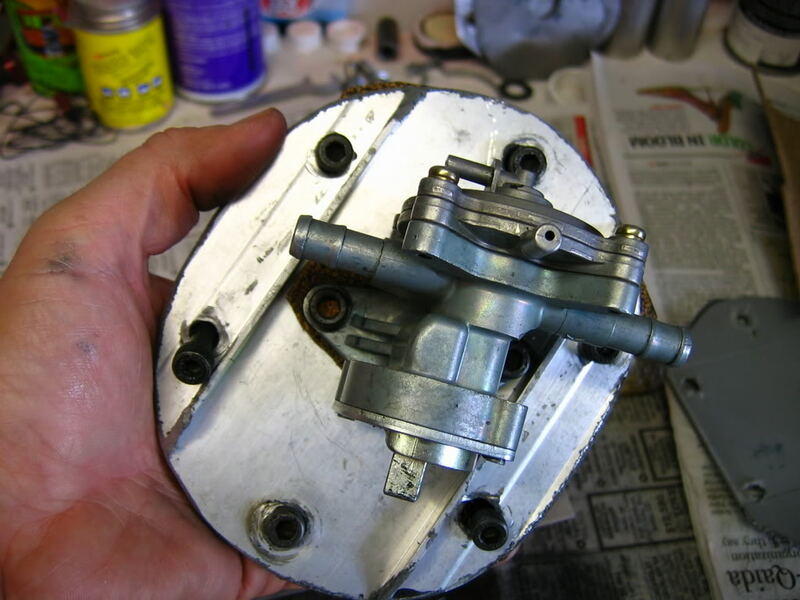 Lectron carbs can take 8-9 psi, but I'd probably set the regulator on a 'hawk to around 6 psi and adjust it from there. It's dependent on the tolerance of the float needles. Yep, those pumps are outrageously expensive. Fortunately my g/f works at a Honda/Kawasaki/Yamaha/Suzuki dealership and I can get parts at 10% over cost. Even so, it's still hard on the wallet for that particular piece. Electrical hookup? You think up the Superhawk mod of the century, and you'd let a few little wires worry you? :P Seriously though, hooking it up would be a simple matter of splicing the wires into a key-on source with a couple inline fuses for safety. No more difficult than wiring up an alarm system. I'll get to work on it and post some pics. I've got my eye on a couple VFR tanks on ebay right now. I picked up my 'hawk on the cheap, but she needs alotta TLC. This is a good place to start. Thanks again for posting your idea and the excellent pics! Boy you've got my interest now! On the electrical issue, I had it in my mind that it was some kind of variable pump controlled by the ECU according to fuel needs. I'm always thinking too much. You make that part sound relatively easy so it seems the most "difficult" part of this is getting one (either used or forking out the bucks for new). 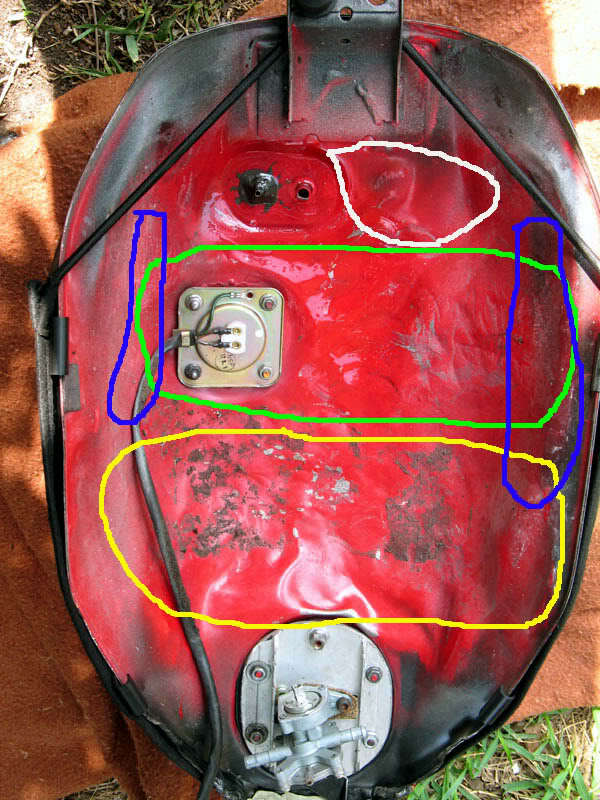 Here's a shot of the bottom of the VFR tank with indications of the areas where I contoured it to the SuperHawks airbox. Green is primary, followed by yellow and blue. The white was wasted effort I think. Initially, I concentrated in the yellow section too much and probably took out more capacity than necessary. The blue areas are the vertical sides and also may not be necessary. Lot's of test fittings will keep the amount of denting (thus capacity) to a minimum. Again, I used a block of soft wood, hammer and/or small sledge hammer to contour the underside. I also used a small id piece of PVC pipe for the fuel sensor area. For that section, I install the sensor and put the pipe around each nut, not on them, when hitting with a hammer. I criss-crossed hitting the four bolt areas just like when torquing a part down. It was my hope that by leaving the sensor bolted in, it would keep that opening level and square thus preventing possible leaks. It doesn't leak. Word of caution: I got tired while using the sledge and hit the vent tube bending it and had to repair it. Last edited by superbling; 06-02-2008 at 02:14 PM. How does the difference in width feel? One of the things I really like about the VTR is the width at the knees being narrow. Keep up the development, and I think you may have a winner for any of us that don't like filling the tank every 120 miles. Yes, it's wider everywhere including between the knees and is quite noticeable the first time you ride it. After a couple of tanks, it feels normal as you adapt. If you want to know how it feels, go sit on a VTEC VFR on the showroom floor. I let a fellow bmw r1150r rider try it and he remarked that mine was too narrow for his tastes! I don't know if it would work, or if it's any bigger, but there's a cbr919 tank on ebay for anyone interested. I replaced the stock and corbin seats I had been using with a VFR VTEC seat (02-present) that matches the tank junction MUCH better. The seat is also amazingly close to the VTR in terms of length and width and, to me, in some ways looks more at home on the bike than the stock unit. add sargent foam as the stock VFR sux! This sounds like a lot but it's all simple stuff done with basic hand tools. I then added a stock VTEC seat cowl to finish it off (need to paint of course) as the stock doesn't fit (too narrow). I have it sitting about an inch further foward than stock to match the VTR's lines better. Last edited by superbling; 10-29-2007 at 09:09 PM. The bike looks good with the seat! 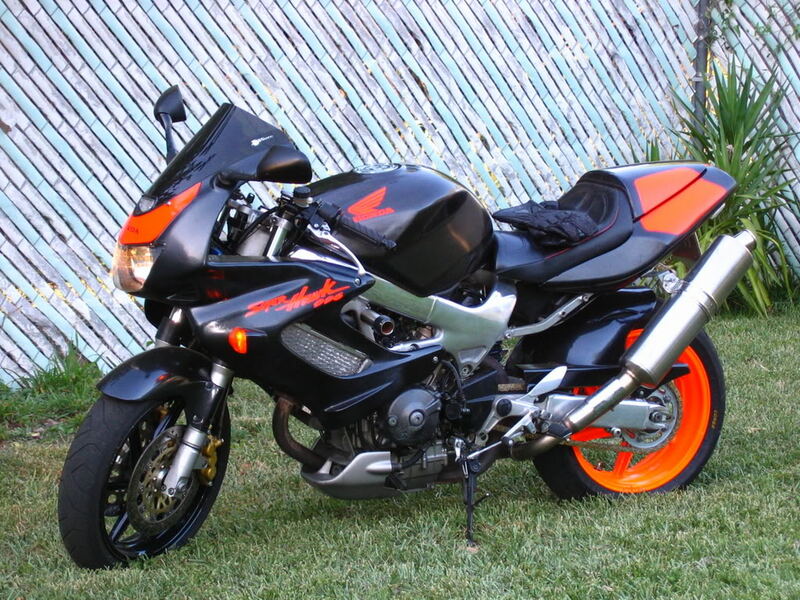 How flush is the tailpiece with the tail fairing? It's remarkedly close. It's a tad wider overall and longer (remember I cut the seat shorter) so I might trim some off the rear edge of the seat cowl when I paint it. The passenger section of the seat sits higher than stock so I might try to relocate the latch lower to compensate. As is this makes for a larger gap between the two cowl pieces than stock but nothing too drastic IMO. I may leave it as is. Interesting but what? 140 miles between stops ain't enough for ya? Don't know about you but after about 100 miles on the bike I'm ready to get off and take a break....It might as well be at a gas station. And I'm out here in AZ where gas stations can be far between. 140miles? WOW, good for you. Me? When I'm ******* it, I can run out at 115 miles with RLOD flickering on in the 90's. I go on all day runs with other riders who keep that kind of pace all day. They wouldn't like me very much if I had to stop every 90 minutes or so while they all still have another hour's worth of gas! On my last group ride, a guy with a new speed triple was the first to hit reserve; not a superhawk for once! WOO-HOO!!! Yup, west texas is just like az. A group ride out to Big Bend last spring was the impetus for "project: long range tank". I would have run out twice with the stock tank on our fun route. Sure, I could have ridden the boring interstate by myself, missing out on the twisty backroads everyone else was enjoying, but what would be the point of that? A larger tank solves one of the biggest limitations of the VTR on the street, IMO. In terms of added capacity versus cost, I thought it was a better idea to go with the VFR mod as opposed to shipping a tank from the UK. 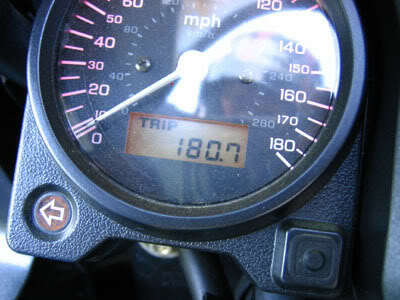 The UK tank adds only a little less than a gallon, whereas the VFR tank can add up to 1.5 or 2 usable gallons more. Also, most UK sellers I contacted did not want to deal with the hassle of shipping it to the US, if they even considered it. the euro late model gained fuel capacity but gave up some airbox capacity/horsepower, so... you'd have to use their airbox, too. The post-2001 Euro model comes with 19 liter tank but it has nothing to do with airbox. Airbox has not changed at all, exactly same and same capacity. It is only tank shape and fuel tap that have changed a bit. 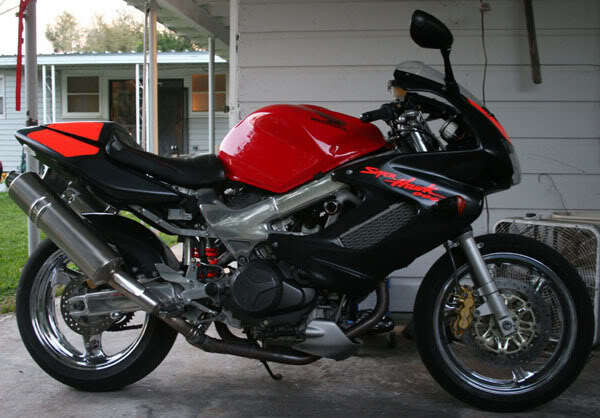 Speaking from experience - I have installed 19 liter tank from 2004 bike on my 1997 without slightest mods to airbox. You might notice, that in stock state 1997 model is in fact tiny bit more powerful than 1999+ model everywhere, not only in Europe or US (check MO tests etc.) - I guess for "green" reasons or something like that. I think it done by small change in ignition advance and jet sizes. Ya don't want it bad enuff! aRE YOU MARRIED/ENGAGED? WHATJA SPEND ONDE ROK???? 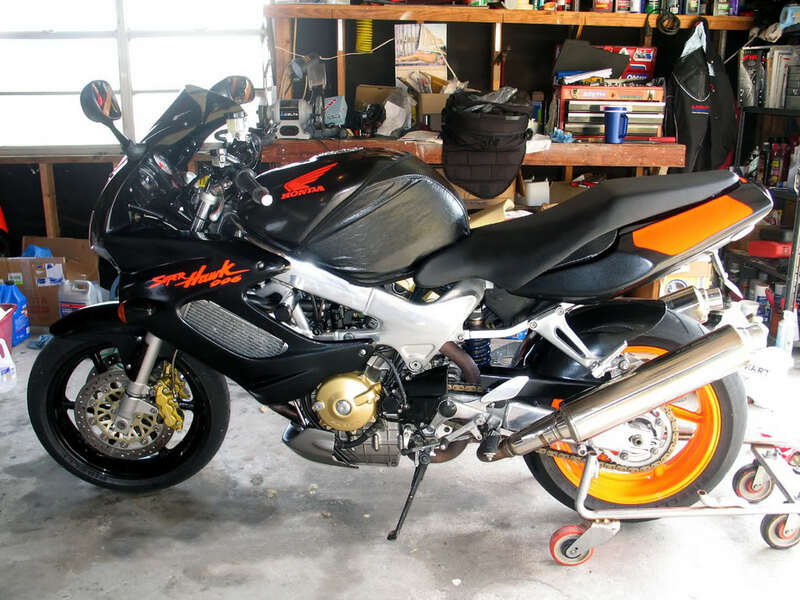 we just traded in her rock for her sv 650 better than a ring in my mind .